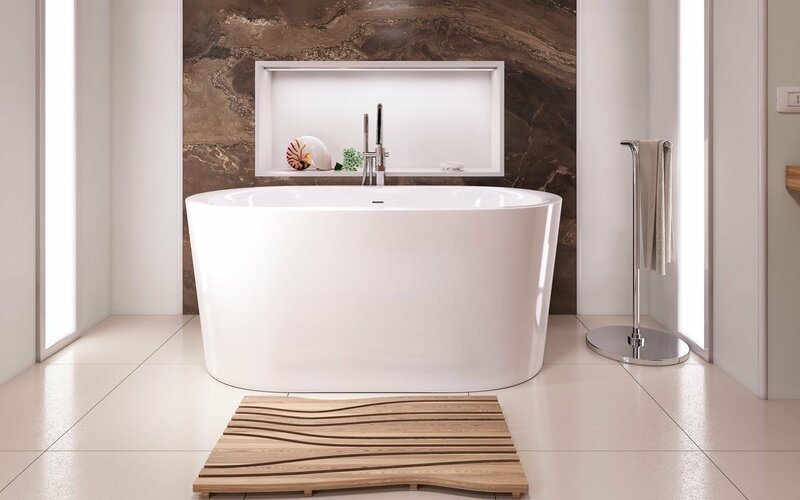 Manufactured in Italy using Aquatica’s highest quality, sanitary-grade precision acrylic sheets and completely redesigned for 2018, this contemporary styled freestanding tub is an elegantly refined and sculpted oval model, delivering high-tech performance, compliant with environmental standards. Allowing for unparalleled heat retention and durability, the walls of the Purescape 014A gently slant outwards to give the bather an ergonomically spacious and full body soak. 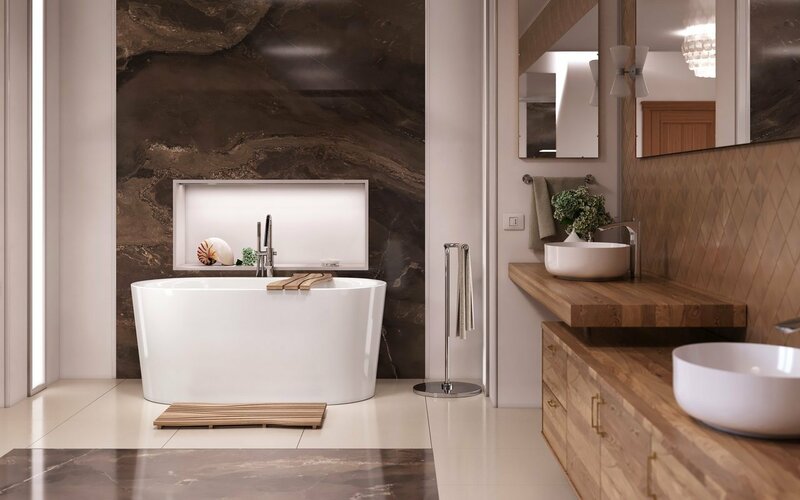 A stunning take on the traditional bath mat, this new floor mat incorporates the rich, warm tones of pure, solid, natural Iroko wood crafted in a very modern, uber chic design that exudes style. This is the ideal accessory for our dramatic, dark, pencil-lead Purescape 748 bathtub, as it reflects the same interpretation of function in cleverly designed and beautifully rendered form. How easy was this! 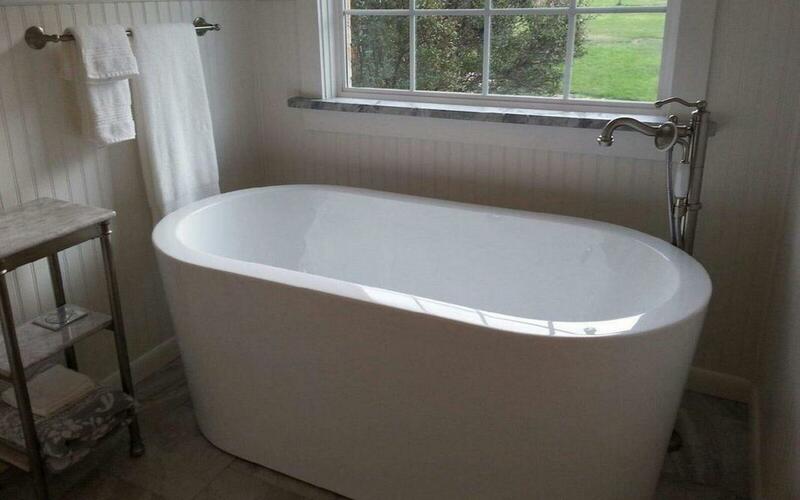 I didn't trust my contractor to supply a tub for guest bath remodel,so I ordered this beauty. It came on time,not a scratch on it. 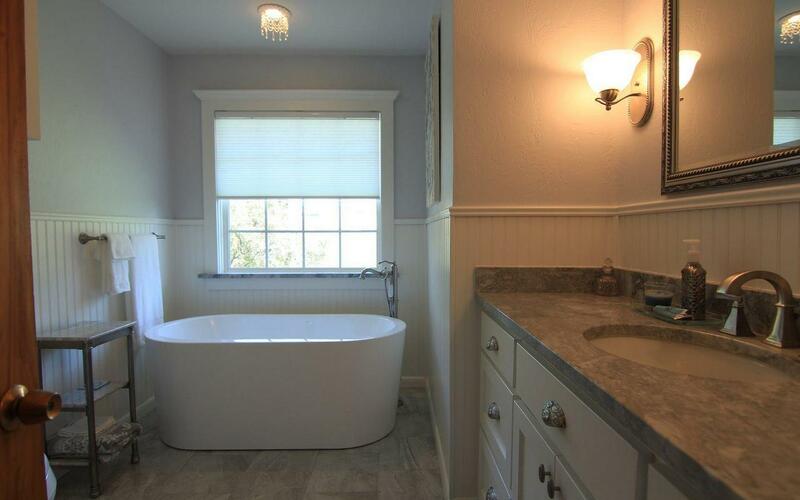 Looks like a custom made tub. Everyone who has seen it assumes this was a special order because of it's petite size-still holds a ton of water!! Perfect. Gorgeous finish. It is stunning and functional! A great addition to our bathroom reno. We are happy with this product. It looks spectacular installed. Can't wait to use it! Gorgeous tub! This is a wonderful tub! I was concerned about how well it would hold water heat, but it does much better than my old tub. Really retains heat. It's a beautiful bathtub and people who walk by our main bathroom stop and do a double-take and then say how great that tub is. Highly recommend this tub. This is the shorter one, so if you want a 6 ft. you need to order the 014b. Water depth is approx. 14 inches. I purchased one of their freestanding tubs over a year ago. I was so very pleased with the product and the customer service. They are top notch and very helpful. I love my tub and it has been the highlight of my bathroom. There's not one person that enters that bathroom that doesn't comment on how beautiful my tub is. (Even the plumbing company guys who installed it were going on and on about it.) I could not be happier with a product or company. Great material! I am getting over a ruptured disc in my back so I've been taking a ton of baths. I'm very impressed with the material of this tub. The finish is very smooth to the touch and it's great at retaining heat. 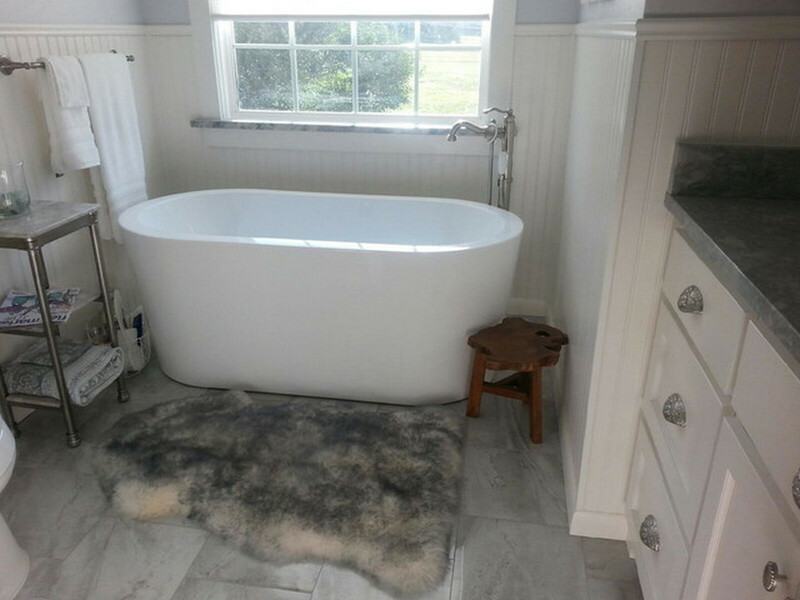 Love my freestanding tub! This tub is awesome! It is a contemporary showpiece in my remodeled bathroom. It cleans up nicely and the water stays warm when you draw a bath. The size fit very well in our small master bath. We placed it in front of a tiles section of wall so that "splashes" from the tub wouldn't damage the wall. We used a floor mounted tub filler with this and the two work very well together. I highly recommend this tub.